From the first view it may seems ridiculous that some strange guy (or rather strange line of coolers) can challenge with such world known brand as Yeti , but here it is- meet brave and new Kysek coolers in our tough competition. 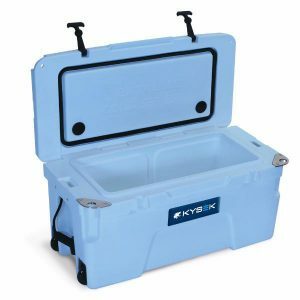 In this article we are going to make a rivalry between the “veteran” in the coolers world- Yeti brand and new but brave and promising brand- Kysek. At some points these coolers are similar, at some points Kysak can show even the best results than Yeti brand. But everything has its time and let’s start from the very beginning. Kysek cooler. What is it and where is it from? The brand called Kysek is the abbreviation of the (Keep Your Staff Extremely Kold) has appeared in 2014 in Los Angeles. This brand was created by John Gutierrez and in the extremely short time period has occupied the first places in many comparison charts. The main purpose while creating these coolers was to find the major disadvantages in all other brands and create the ideal coolers by fixing these flaws. Gradually by fixing the small disadvantages and improving each detail, manufacturers of the Kysek coolers have created the high-end option that nowadays is a good and strong competitor to the world famous models. What’s so outstanding? 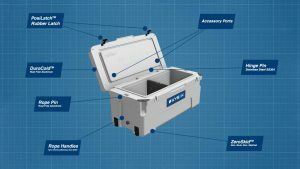 Unique Features of Kysek Coolers. 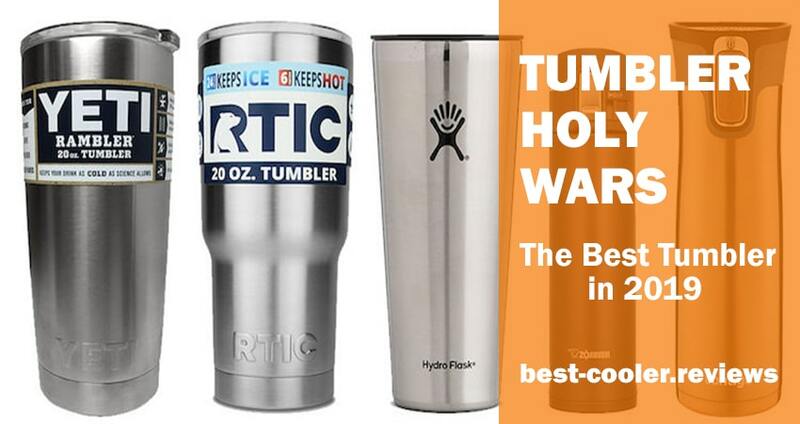 Actually we don’t want to exaggerate the uniqueness of these coolers and make them “unreal”, a lot of their features are similar to such other popular brands as Engel, Pelican or yeti. Among such features you will find the well-known rotationally-molding technology, anti-slippery feet, durable rubber latches that should be pulled down to open and bear proof durability. All these features you will find in any other high-end cooler. But nevertheless Kaysek coolers have their unique features that stand these guys out of the crowd. It will be better to consider each of these features separately. Let’s begin! This feature of Keysek manufacturer’s products is the most famous. Our team fell in love with its wheels immediately when making this review. The point is that each of coolers designed by this manufacturer is equipped with the INBUILT wheels! None of the coolers available nowadays can’t boast of such pretty simple but so useful feature. So, what’s so special in these “magic” wheels? Firstly it is the thing that made this brand as unique and unrepeatable as it is nowadays. Let’s consider details. The coolest thing in design of these wheels is that when your cooler stands on the ground, the wheels don’t touch the ground, only anti-slippery feet touch it. But! When you tilt it even a bit, these wheels start their work and significantly simplify cooler’s transportation even when it is completely filled. You should tilt it per eight degrees only and the wheels will occur. All options made by Kysek ( 35L option and not only) are equipped with wheels excluding the 25L model which doesn’t have such feature. Wheels are extremely tough and can stand up to five hundred lbs of coolers weight, that means that even if your cooler is fulfilled, you shouldn’t be worry that its wheels can be broken because of this. 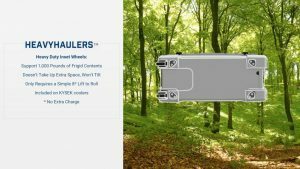 The Kysek wheels work good on any type of surfaces, the one thing that can slow them or make them hard to move is the sand on the beach or soft mud. If you don’t want to carry your cooler on the back and get injured, or simply want to simplify your life (what is also a very good idea always) it’s a great choice to pick one the Kysek models that are equipped with wheels. As all we know the real success consists of small things together. Same thing is about Kysek coolers, where manufacturers have thought over each detail. Among such small things that led Kysek coolers to success and put it into the one row (and even higher) with world-leading brands is…openers for bottles. So simple, so small and so useful, because what can be worse than cooler filled with beer and lack of beer opener to open it and enjoy the first sip. 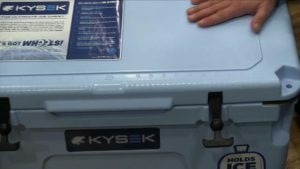 Kysek coolers are equipped with the bottle openers at the corners of their body, into the locking brackets. So, don’t worry, you can go to a great party with your friends and enjoy your favorite cold beverages. 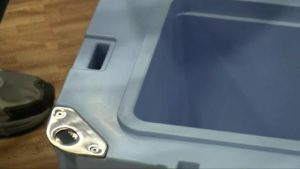 The plug for drainage allows you to empty your cooler from the melted ice easily and fast. Coolers designed by Yeti are equipped with drainage plug with the dimensions three/four inches which you can also remove if you want to drain your cooler as fast as it’s possible. The plug for draining that built-in the Kysek coolers are similar to Yeti’s ones but don’t forget that we are talking about the unique and unusual guys, so here should be something special. And yes, Kysek coolers will please you with TWO plugs for simple and very quick draining. The dimensions of these plugs are two inches. Now it’s time to speak about the most exciting part of all coolers’ characteristics –about its insulation. This feature is like a business card for every cooler that shows “how cool it is”. No joking, the higher is the level of insulation, the better is the foam used and the thicker are the walls of cooler, the longer period of ice retention you will get. The average value of insulation for modern coolers is two and a half- three inches of insulation on the cooler’s lid and two inches of insulation on its walls. Such crazy guys as Kysek manufacturers DOUBLED this value and made a coolers line with the four inches of insulation. This is the highest insulation level available nowadays. Beside of anti-slippery feet of Kysek coolers the manufacturers can also surprise you with the anti-slippery lid with the special textured surface that can be also used as a cutting board and will not be slippery even when wet. Yeti coolers’ lid can also be used as a cutting board but it is smooth and because of the lack of textured covering it is slippery when becomes wet. Another small and from the first view minor, but actually very useful improvement. Inbuilt ruler in each Kysek cooler is probably as important accessory as the openers for beer bottles. Especially for fishermen which immediately after catching the fish want to measure it and to boast to their friends. This accessory can be useful not only for fishermen, of course, but for “fish” case it is an integral part of the cooler. Both centimeters and inches scale are available. By the way, Yeti coolers don’t have ruler. This option is additional and doesn’t come with a standard cooler. But it is available and you can additionally purchase the smart Kysek’s accessory. 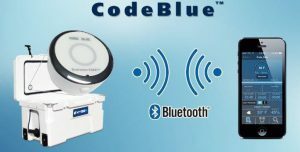 It is a special gauge that can be place into a special spot inside a cooler and will be able to show you the current temperature inside your cooler through the Bluetooth connection. Thus you will be able to check when it’s time to refill your cooler by just reading the info on the screen of your smartphone without any necessity to open the cooler every time. It shouldn’t be said that it is useful accessory to everyone but still there are a lot of people who may find this addition very valuable. Everyone knows that good coolers are quite expensive and their price is fully justified by their high-end fetures. So, if you finally decided to purchase REALLY good cooler be ready for comparably high price tag. But high price tag can also differ between different brands. 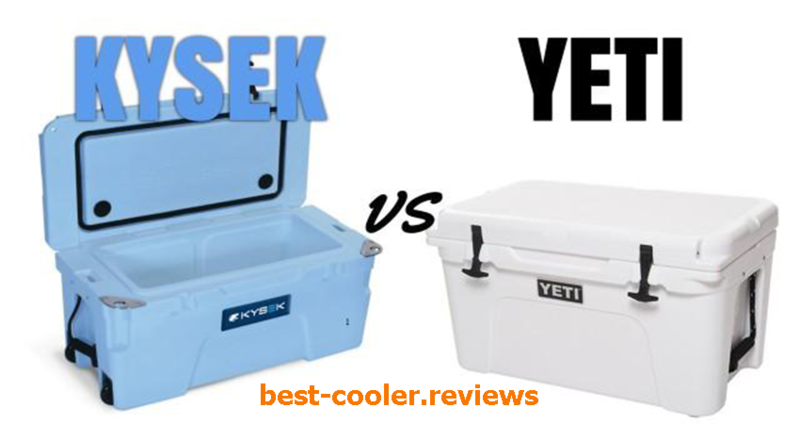 If comparing with the yeti brand, you can purchase Kysek coolers with around ten dollars cheaper price. This is quite a small difference, but still it exists. And don’t forget that together with a bit cheaper price you will get such unique features of Kysek coolers as two plugs for water draining, built-in openers for bottles, built-in ruler, anti-slippery lid which can also serve as a cutting board, unique wheels and the highest insulation available today. If summarize everything, you will see that these coolers are really worth this price and if you are ready to spend a good sum of money for your new purchasing, spend them for something really excellent. 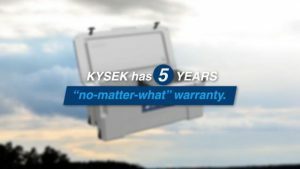 The last unique and outstanding feature of Kysek coolers that we wanted to present you is their warranty. 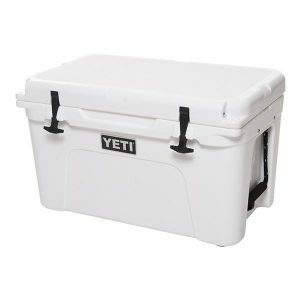 Actually this feature is not unique because the Kysek coolers warranty is equal to five years, the same period of warranty is also offered by Yeti coolers. The good thing here is that this warranty can cover everything, starting from handles and wheels and finishing with more serious breaks. Final decision. Which one to Choose? Now it’s time to sum everything up and make a clear conclusion which cooler is worth your attention and purchasing. So, Yeti or Kysek? Drumroll…And the winner is … Kysek ! Our team made a decision that these guys will be a better choice than Yeti coolers. None choice can be unsubstantiated, so let’s consider why we came to such decision. The first thing is the Kysek’s improved insulation. Nevertheless four inches is much better than two, isn’t it? Then the Kysek’s wheels. We devoted the whole paragraph to them, so we just say that if you appreciate your health and don’t want to spend your time and money by visiting the traumatologist, you need them. And of course the price. 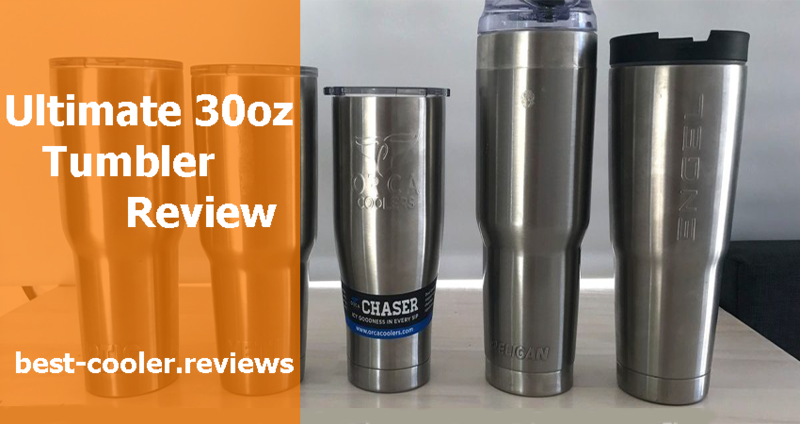 Yes, the difference in price is minor, but don’t forget that in a Kysek case you will also get some additional features that Yeti coolers can’t offer you. So, the choice is Kysek and we hope that you will not be disappointed with it. Yeti Coolers are still one of the Best. We don’t want this article to be created against the Yeti coolers, no way. So, here we will give you some reasons why Yeti coolers also worth your purchasing. Don’t forget that Yeti coolers are among the best brand nowadays and have more experience in the coolers world than Kysek. So the first reason why you can give your preferences to this brand is the name. A lot of people care about brands, they think that famous brands mean better quality and are trustworthy. Beside this people who own the brand things are considered as more successful persons. It is like owning the iPhone and smartphone made by another brand. Both options can be equal at their characteristics, but person with iPhone will be considered as the more successful. Another point in favor of Yeti coolers is their design. This brand can boast of more modern and stylish design with more colors available than Kysek one. And the last thing we want to emphasize about Yeti coolers is their availability at stores. These coolers can be more easily purchased in comparison with Kysek because they are well known and very popular during already many years. So if you don’t want to spend much time for searching your new cooler, this choice will be much simpler. Finally we present you two links to the Amazon website where you can check the current price of both these coolers brands and make your final choice.